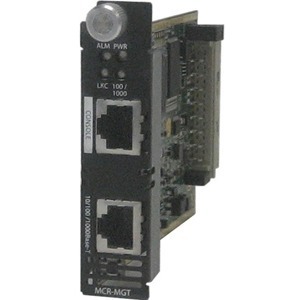 An MCR-MGT Management Module installed in a Perle Media Converter Chassis provides the most secure media converter platform on the market today. Enterprise and carrier-grade security is available through the support of strong authentication systems such as TACACS+, RADIUS and LDAP. Secure in-band access is assured via SNMPv3, SSH CLI and secure HTTPS Internet browser.